That might be what they call it in other states, or what people might call it who have never seen a game, but here in the state of Alaska it is Flag Football. I have to admit, my view of Flag Football has been less than positive. In the past few years, a few games have been played between the JV boys and Varsity boys football games, and I honestly found it a great time to go and get some food, or try to take a nap. I just do not get it. Last night, August 24th, I went to Eagle River High School and shot not one, but two games. I can not say that I am a fan yet, but I did shoot two games and did not fall asleep. 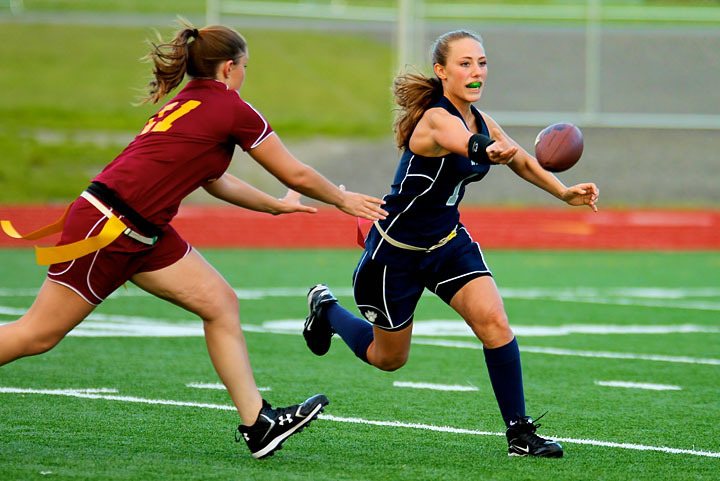 When the Alaska high school sports league made the announcement a few years ago and said that they were going to start women’s flag football my first thought was “Why?”. I checked the internet and at that time, one other state had flag football as a varsity sport. Florida. And it was called Powder Puff Football. Now, when I was in high school, the boys fall sport was Football. Girls had two main sports, Soccer, and Volleyball. The guys got soccer in the spring. Here, both the boys and girls soccer teams play in the spring, and I guess moving the girls to the fall was not considered. But yet, there a many more girls sports that are being played in more places than flag football was. Why not field hockey, or lacrosse? I guess what it boiled down to in the long run was money, and it was much cheaper to start flag football than to invest in the special goals for lacrosse and all the player gear. It is too bad though. At least with LAX or field hockey, those are sports that some of the girls might have a chance to earn a scholarship in. So, back to the game. I have tried to shoot flag football before and I just could not follow it. It was not until last night that things started to fall into place. I figured out that a team kicks the ball off, and you start wherever the play ends. Simple, just like regular football. But, if the ball is kicked past the 20 yard line, like to the 18 yard line, you have 4 plays to get to the 20. If you get to the 20, you then have 4 plays to get to the 40, then 4 to the next 40, then the 20, then the goal line. No 1st and 10, no chains. Ok. Starting to make sense here. 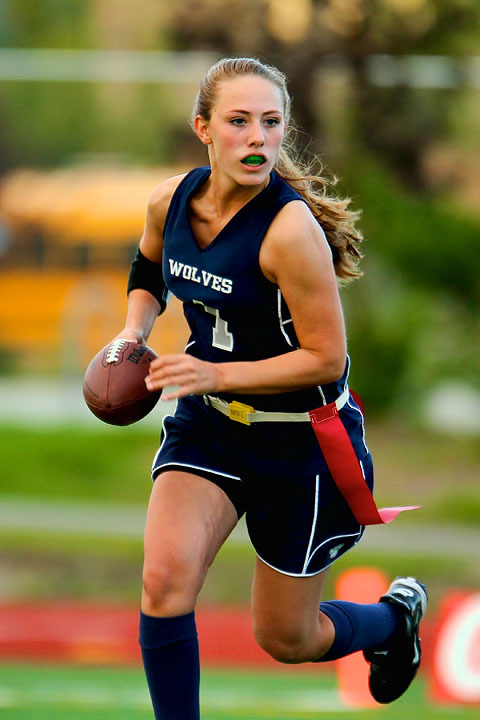 One of the Eagle River girls tossed the ball to the running back and she dropped it. I am standing there getting excited, expecting coaches and players to start screaming “BALL BALL BALL” and go to pick up the fumble. Nope. Ball hits the ground, play is dead. Ok, so no fumble. Team scores and the referee asks if they want 1, 2 or 3. I have no idea what the difference is. The only choice I ever heard accepted was 1. I would assume that whatever you choose, you are different distances from the goal line and the extra points would be 1, 2 or 3, but do not quote me on that. I think that is the basics of the game, and once I was able to understand the rules, I was able to start watching the game through the viewfinder and create some images. It was not quite as exciting as boys football, but I was also finding that I was not running up and down the sidelines as much. So I am still uncertain if I am a flag football fan, but I have figured out, I can watch the game now and understand what is going on, unlike something like cricket. This entry was posted on Wednesday, August 25th, 2010 at 3:51 pm	and is filed under Sports. You can follow any responses to this entry through the RSS 2.0 feed.